Wake up every morning to stunning views of the San Juan National Forest while sipping your coffee from our balcony or sitting in condo. Or sip on your favorite drink at the end of the day by the fire. Our mountain home located at Cascade Village, 1 mile north of the ski resort Durango Mountain Resort formerly known as Purgatory, sleeps up to 10 people. Three (3) bedrooms, loft with fouton, plus three (3) full bathrooms, sleeper sofa downstairs, fully equipped kitchen, tennis courts, pool, jacuzzi, tennis courts, fire wood provided, full size washer & dryer. Activities - snow skiing/boarding, snowmobiling, mountain biking, alpine slide (summer only), jeeping, hiking, Durango Narrow Gauge Railroad, river rafting, Mesa Verde, horseback riding, zip-lining, Trimble Hot Springs (year-around). Click on link below for additional information for this property. In the main lodge, a large indoor pool and Jacuzzi overlook the surrounding outdoor deck and hot tubs, and you can meet your neighbors while grilling or playing tennis. A business center has computers to use (but you're on vacation, remember! ), and also a game room. 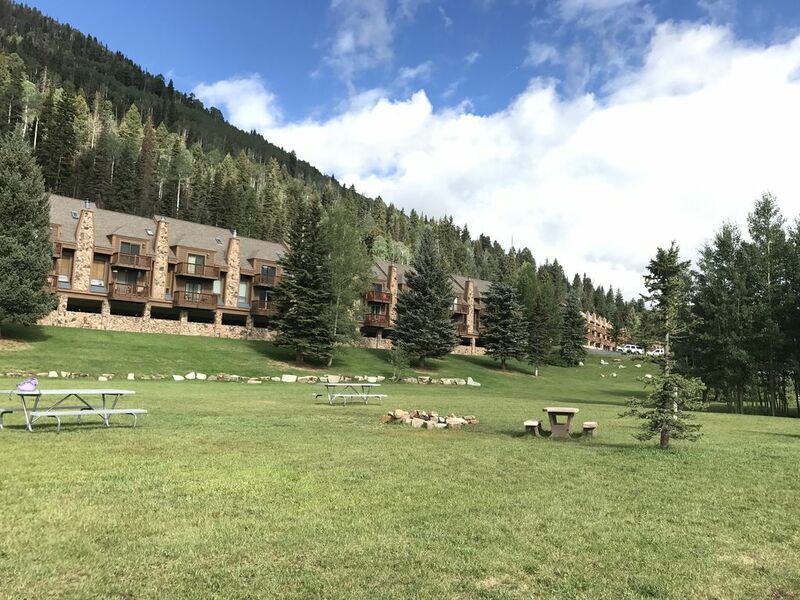 Durango Mountain Resort is 2 minutes down the road, but you are away from the noise and much more in tune with nature at Cascade. We live in Spring, TX and we had been coming up to Durango, CO for many years before we bought our place in 2005. Before we bought our condo, we knew we had found our second home town and began looking for many years. The skiing is great at Durango Mountain Resort, the summer's in Durango are perfect and the fall colors are magnificent. Our family loves to celebrate New Years here, zip lining in summer, and hiking. So much to too, never enough time to get up here. We hope you and your family choose our place. Cascade Village is in a very special spot in the world! It is surrounded by national forest and their are trails walking distance from complex. Full size front loading HE washer located on main level in condo. Full size dryer located on main level in condo. Extra dining room seating at kitchen bar, seats four (4). Located in main lobby building: Indoor pool, indoor and out door hot tubs, game room, tennis court. This condo is very much as pictured. What you don't see, is how great the location is. This condo meet our expectation and needs and we would most definitely stay here again. Added bonus, Tiffany was excellent to communicate with and was always very helpful. We really appreciate you taking the time to write such a fantastic review and we sincerely look forward to your return soon! Anything we can do to help with your next stay, just let me know. Our family of 5 (mom, dad, 21, 14 and 12 yo) stayed for 1 week in Jan 2019. - antiquated TV/DVD system - no HDMI anywhere, no support for Netflix or any online streaming. - there is indeed a shuttle between the condo and the ski resort, but it is only 3 times / day (8:30AM, 9:00AM, 9:39AM) (return 3:00, 4:00, 5:00 pm). Even less outside of peak season. - actual distance to resort is 1.9 miles - making it impossible to walk (also no safe way to walk between condo and resort). - parking at ski resort is very crowed - while it's only a short drive from the condo, it can take up to 45' when you end up having to park on 'overflow parking' then catch the bus. Enjoyed the condo, great for families very nice accommodations. We will return again!! Thank you so much for choosing our property for your vacation. We are delighted you had a wonderful stay and we hope to have you become one of our many returning guests! Look forward to hearing from you again soon. Our family enjoyed our stay at the condo. We had 4 adults and 2 teens and it was the perfect space. The condo is next to the shuttle pickup to take us to Purgatory and back each day. We had all the comforts of home we needed and beautiful views each day. Thank you for taking the time to write lovely review. We sincerely hope you return soon! Great Location! Easy access to Purgatory. We all had a great time even though the snow/skiing wasn't that great. The condo was very nice with lots of amenities. Was fun having a fire every night. The soaker hot tubs were a hit with the kids. We will definitely be back, and next year hopefully more snow! Thank you so much for awesome review and we look forward to you returning soon! We had a great time with our family. The condo was more than we expected. Thank you for taking the time to write a glowing review! We look forward to you returning soon! Located 1 mile north of Durango Mountain Resort aka Purgatory, 25 miles north of Historical Durango Downtown and 20 miles south of Silverton. Durango Mountain Resort just voted one of best top 10 ski resorts. Also enjoy the amazing summer in Durango. So much to do and see. Enjoy the DNGRR, visit Mesa Verde, spend the day sightseeing on the Million Dollar Highway.